The tabla is the most commonly played drum set in North Indian music. It is the instrument most frequently used to accompany vocal and instrumental music, and dance; whereas its primary function is to maintain the metric cycle in which the compositions are set. Though the tabla is essentially an accompanying instrument, the tabla players are also soloists in their own right, and many have vast repertoires of elaborate compositions handed down orally from generation to generation. 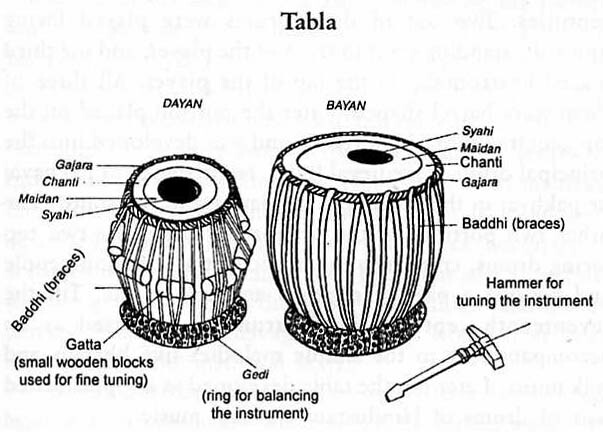 The tabla takes its name from the tabl of Arabic origin. The general meaning of the term tabl is an instrument facing upwards, with a flat surface. Scholars opine that the term table of the English language has been taken from the term tabll Some are also of the opinion that the term tabl is not an Arabic word in origin, but is borrowed from the Latin tabula. In the beginning, the instruments which were egg-shaped or hemispherical, with skin stretched over the opening, which can also be called kettledrum, were called tabl. These were essentially martial drums, which accompanied the military expeditions of Muslims. Though made of metal, these kettledrums were originally derived from the pot drums of primitive men. Later they became rounded like the egg; this may have been an adaptation to facilitate carrying them on the back of a horse or a camel. Slowly it became a generic term used as a prefix for all types of percussion instruments, spread over in the Middle East, no matter what shape they are, i.e. the tabl-baladi, the tabl-turki, tabl-naqqara, tabl-migri, tabl-al-gawig, etc. As stated earlier, the tabla seems to have been in the beginning an instrument which suited the lighter variety of music and hence was very popular with the common people. It, however, remained confined to folk music and to the simple music of the lower castes, till the beginning of the eighteenth century. Around this time, with the downfall of dhrupad, a style of singing, and its allied instruments like been and rabab, pakhavaj also lost its popularity. A new style of singing, i.e. khayal, came up. For the accompaniment of khayal and its allied instruments like sitar and sarod, the need of a new percussion instrument was felt, which had the majesty of the pakhavaj yet could be played in a lighter manner as well. The tabla had the versatile tonality to serve both purposes. The tabla might have made its presence felt in Hindustani classical music around the early eighteenth century during the reign of Mohammad Shah Rangeele. Sudhar Khan was basically stationed in Delhi, and therefore his school, or style of playing was called Dilli Baj or Dilli gharana. Later on his disciples scattered in various regions of northern India, and thus with the time span, several other tabla-playing styles came into being, but the source or the parent style of all these new schools remained the Delhi school. The principal tabla schools that emerged and flourished are: Dilli, Ajrada, Lucknow, Farrukhabad, Benaras and Punjab. Gradually, with the passage of time, the tabla acquired the rhythmic patterns and techniques of other percussion instruments such as pakhavaj, dholak, naqqara, etc., and shot to the peak of popularity in a very short span of time. The tabla is an instrument of fingers, whereas pakhavaj is an instrument of an open hand (thapi). Therefore the rhythmic patterns which can be played on the tabla with unimaginable speed are impossible to produce in pakhavaj. Moreover the positioning of hands on the tabla is more natural than on the pakhavaj. A variety of tonal effects can be obtained by varying the manner of striking as well as by striking different parts of both the heads of the tabla. The modern tabla has a highly developed technique of playing and in the hands of a master player it is capable of producing almost all the patterns of rhythms and cross-rhythms that a musician can conceive of. The well-established time cycles are rendered in terms of drumming phrases called thekha or measured beat. The tabla consists of two drums, the bayan or the left drum and the dayan or the right drum, but the collective name for both the drums is tabla. The left is a small spherical drum, which resembles the shape of the kettle drum. It is made either of clay or metal such as copper, bronze or even a thin iron sheet. The right hand drum or dayan is made of seesam, khair, neem or mango wood, but preference is given to seesam wood. The standard size of the right drum is of ten-and-a-half inches height, the diameter at the bottom being about seven inches to eight-and-a-quarter inches and the upper playing surface varies between five to five-and-a-half inches. The left drum called bayan, is almost of the same height, around ten inches high, but the playing surface is about ten inches and the bottom is about two-and-a-half to three inches. The goat skin stretched across both the drums is made of multiple membranes, one full and the other on the periphery of the full skin called kinara or chanti. This parchment, called pudi or chhavani, is tied to a plaited strip called gajra. Gajra is made by joining four or five leather braces made of goat or cow skin. Gajra is fixed to the mouth of the drum by means of leather braces called baddhi, made of buffalo skin. These braces are tied to another ring at the bottom of the instrument. There are sixteen holes or ghar to which the braces are tied at equal distance, giving the instrument an equal tension at all the points. Beneath each pair of leather bracing, a small tuning block of wood (gatta) is kept. In all, there are eight tuning blocks. By moving them up or down, the braces are tensed or loosened, thus varying the tension of the pudi, and the instrument can be tuned to the desired pitch. The most important and significant part of the parchment is the black paste called 'syahi', about seven centimetres in diameter; it is affixed centrally on dayan and eccentrically on bayan. The syahi is a finely ground mixture of iron powder, glue, paste of wheat flour and charcoal powder (some makers prefer rice powder instead of wheat flour). This paste is applied layer by layer on the surface of the parchment. After applying one layer the same is polished with a smooth stone, and before this layer dries out another layer is laid. This work is done by highly expert tabla makers and the total thickness is judged only by experience. Both the drums are placed upon rings made of cloth, which provide stabllity during playing. The height and weight of tabla as well as the application of syahi, and making of pudi, all these procedures have modified and changed a lot during the past hundred years. Things have become more refined and the instruments are made with a more professional approach. The tabla is made all through the northern part of India but the ones made at Delhi, Mumbai, Benaras and Calcutta are of a superior quality. The parchment called pudi is prepared at many places. Each place has its own unique style of preparing it. Delhi, Mumbai, Pune and Calcutta are famous for their special technique. It is made in different sizes to match the different pitches of vocalists and instruments. While the tabla is placed in front of the player, the player sits cross-legged to play on it. The modern style of tabla-playing originated in Delhi, and subsequently it travelled to Lucknow, Farukhabad, Bareilley, Ajarada and finally to Benaras. However, some people are of the opinion that there is an independent style of tabla-playing prevalent in Punjab. Today, the tabla has become well-known and is extremely popular globally. There are hundreds of artists who with their continuous sadhana and life long dedication enriched the instrument's technicalities and in its vast repertoire and popularity. Some unforgettable names are Ameer Husain Khan, Thirukva Khan, Habibuddin Khan, Ram Sahay, Abid Husain Khan, Anokhelal, Lateef Ahmed and Gudai Maharaj, along with the living legends like Alia Rakha Khan, Kishan Maharaj and Sharda Sahay. Among the younger generation Zakir Hussain, Sapan Chaudhari, Anindo Chatterjee, Kumar Bose, Shafaat Ahmed, Bikram Ghosh and several others are the prominent tabla players that India has produced.